Below is the write up on my artwork as well as a link to their site! Ari Robinson of St. Petersburg is harnessing the power of color and light to create her transcendent works of art. She is a collage and installation artist, whose pieces can be uniquely characterized by soft organic shapes that overlap and trail one another in a close relationship that amounts to a dreamy, most colorful composition. Robinson’s collages are initially dreamlike and immersive. She plays with colors and the relationships they have with each other in such a way that you can feel your mind wandering down a colorful brick road. Each collage is an accumulation of these vibrant shapes, and each has its own moody vibe. Ah, the power of color. “Paradise” is a dreamy piece that feels like a trip into the cotton candy clouds of a fantasy. Shades of pink consume most of the initial visual, but look closer to see it’s truly a whirlwind of colors. Iridescent paper reflects bright teals and light pinks, while organic marbled designs of orange Creamsicle and violet compliment the stand-out shades. The shapes are layered atop one another and meander in the same direction, almost like scales growing on a mermaid’s tail. The piece is coated in luscious, high-gloss resin, which makes it that much more luminescent. Similar to her collages, Robinson’s installations are characterized by her distinct amoebic shapes and wandering compositions. She uses painted wooden blocks with softly rounded edges to create her abstract installations. 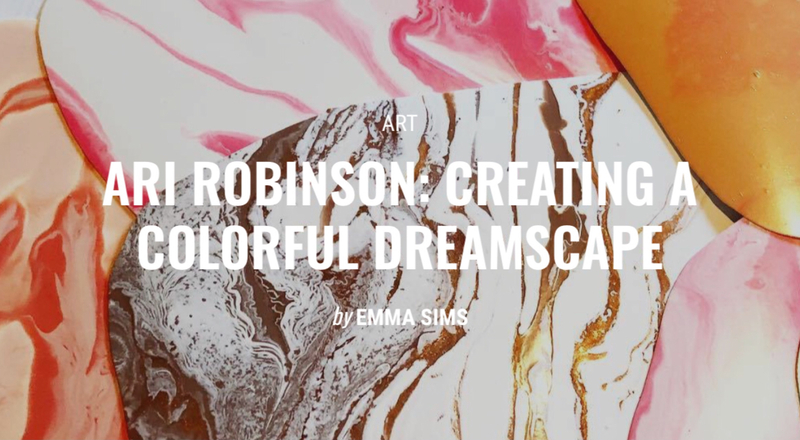 In Robinson artistic style, the blocks are layered on different levels to create a multidimensional composition that literally jumps out at you. One of her works, installed in a beach club and restaurant in Miami, looks like a wave of beautiful sea glass whisking across the wall. This piece has an ocean-vibe color scheme, with variances of blues and teals. It’s surreal and so appealing, as is all work created by Robinson’s hand.